是時候了。 Now is the time. 一直以來都夢想有自己的室樂團。經過<禾．日．水．巷>四年的歷練之後，我知道要 再進一步，便需要有固定的團隊，更有計劃恆常地創作、試驗、演出及改進。 It has been my lifetime dream to have my own chamber group. I realised after the world tour with “Hong Kong Episodes”, if I want to go further, we need to establish a regular team to create, experiment, perform and evolve. 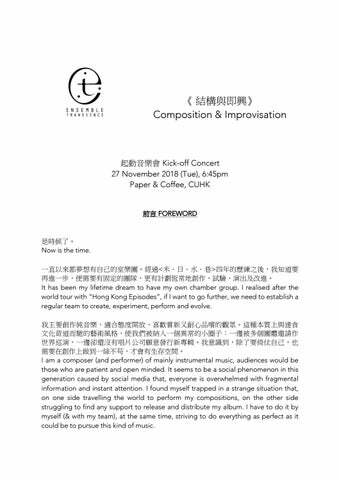 我主要創作純音樂，適合態度開放、喜歡嘗新又耐心品嚐的觀眾。這種本質上與速食 文化背道而馳的藝術風格，使我們被納入一個異常的小圈子：一邊被多個團體邀請作 世界巡演，一邊卻還沒有唱片公司願意發行新專輯。我意識到，除了要倚仗自己，也 需要在創作上做到一絲不苟，才會有生存空間。 I am a composer (and performer) of mainly instrumental music, audiences would be those who are patient and open minded. It seems to be a social phenomenon in this generation caused by social media that, everyone is overwhelmed with fragmental information and instant attention. I found myself trapped in a strange situation that, on one side travelling the world to perform my compositions, on the other side struggling to find any support to release and distribute my album. I have to do it by myself (& with my team), at the same time, striving to do everything as perfect as it could be to pursue this kind of music. 香港是個節奏急速的城市，一向着重娛樂多於藝術。但量多質會高嗎？慢，日復一日 做同一件事，才有時間追求完美，沈澱思維，尋找有個性的風格。 Hong Kong is known to be a fast paced city, where entertainment is needed more than art. Quality and originality are not always the priority. In truth, it takes a whole lot of time and commitment to work on a craft to reach a certain level of perfection, and to have an original voice. 作曲家對結構的固執和即興表演者對刺激的追求，好比社會規範和創意互動，每每都 是在找平衡點。爵士和古典樂不是非黑即白的兩種音樂，我相信兩者只是不同卻互補 的音樂風格，中間有着看不見底的潛力有待發掘。 Composers pay close attention to structures while improvisers crave for excitements; which is strikingly similar to take balance between social harmony and individual creativity. In my opinion, through improvising composed music materials, jazz and classical music are not in contradiction rather they complement each other. This practice leaves a huge potential of possibilities to discover. 這𥚃是樂團合適的地方嗎？我不肯定。近年，社會以至全球的發展告訴我，沒有甚麼 是必然的。我相信忠於自己，做沒有人做過的事，往往會有新出路。《禾．日．水． 巷》和《載行》就是在這個心態上面世的。而這個《瞬．樂團 – 結構與即興》計劃， 將會更義無反顧地向全方位推進。 Is Hong Kong the right place for Ensemble Transience? I am uncertain. In this modern society, there is no only route to success. I believe in trying to create something that not there yet will open the door to a new world. This is the mentality when “Hong Kong Episodes” and “Departure” were curated. 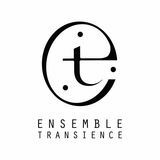 In the upcoming project - Ensemble Transience: Composition & Improvisation, I hope to take a step further and push the boundaries fearlessly. 作為本土香港人，第一次被委約創作一個音樂會也是在這裡。與其說這個城市需要藝 術家，不如說是需要多一些固執得拒絕平庸的人。去迎合，不如還是大刀闊斧去做來 得過癮。 Born and raised in Hong Kong, I am thankful to have my first commission for a music concert here. I believe not only this city needs more artists, but more dedicated creators who strive for perfection. Instead of ingratiating for approval, I would rather go all-in bold and decisive. 在起動音樂會上，除了有濃縮版的演出，我們會詳細介紹計劃中的兩個主要音樂會， 包括邀請到東南亞和世界知名的樂手來港與本樂團一同演出，還有一個夏日音樂祭慶 祝我們的成立。 In our upcoming kick-off mini concert, we will perform a short set of original music and introduce our upcoming main concerts: including bringing renowned musicians from South East Asia and worldwide to work with our ensemble, as well as a summer concert celebrating our establishment. 教育層面上，我們的五人小型樂團會去八間學校作示範演出，並且招生成立一個青年 團，將安排一系列由國際級音樂家指導的「腦洞大開」大師班、由星級導師帶領的工 作坊，並給予一同演出的機會。希望以音樂為語言及節奏為核心的切入點，開拓年青 一代對古典和爵士音樂的興趣；同時重視音樂應該是「好玩」的本質，避免傳統學業 中對與錯的壓力。 At the aspect of music education, our reduced 5-piece ensemble will perform 8 guided concerts at schools. We will also recruit a youth ensemble, which they will go through a number of mind-blowing master classes and tailor-made workshops from our star tutors. They will also be given opportunities to perform. We believe music is a language and rhythm being the treasures of our origins. Music education should be fun, and focus on how music connects to our soul instead of just being graded right or wrong. 我們不追求短暫的成果，著眼是學習的過程，和未來音樂圈子的長期健康發展起着一 個漣漪的效果。 We weight the process over the result, being a musician is a life-long journey of searching for oneself. We hope to enhance a more diverse music scene. 感謝一羣和我一起計劃的拍擋和合作夥 Thank you for my team and cooperation partners：Kiwi Chan, Ka Chun & Miso Tech, Phoenix Lee, Stir Production, Canopus Drums, Brewnote coffee, Dpa microphones.